EagleVail’s Mikaela Shiffrin moved into a tie for the seventh most wins in World Cup women’s history on Thursday, claiming a slalom in Lienz, Austria by nearly a second over Switzerland’s Wendy Holdener. Shiffrin’s fifth victory of the season tied her on the all-time list with Germany’s Katja Seizinger at 36 career wins. Up next on the list is sixth-place retired Austrian great Marlies Schild — Shiffrin’s idol — with 37 career victories. Shiffrin is just 22 years old. The defending overall World Cup champion, Shiffrin also expanded her lead in the current overall chase to 821 points over Germany’s Viktoria Rebensburg with 430 points. In her classic dominating style, Mikaela Shiffrin (Eagle-Vail, Colo.) built up a huge advantage on her first run, then charged in the second to win her 36th career FIS Ski World Cup race on a rutted slalom track in Lienz, Austria, Thursday. “They did a really great job preparing (the course) after the rain and the snowfall. It was not easy, but it was a pleasure to ski,” Shiffrin said following her 27th career World Cup slalom victory. Switzerland’s Wendy Holdener was second, followed by Sweden’s Frida Hansdotter in third. Resi Stiegler (Jackson Hole, Wyo. ), whose father Pepi – the 1964 Olympic slalom gold medalist – grew up in Lienz, was 25th. Shiffrin, who scored her first World Cup podium in slalom in Lienz in 2011, skied to a 1.14-second first-run advantage over Hansdotter. 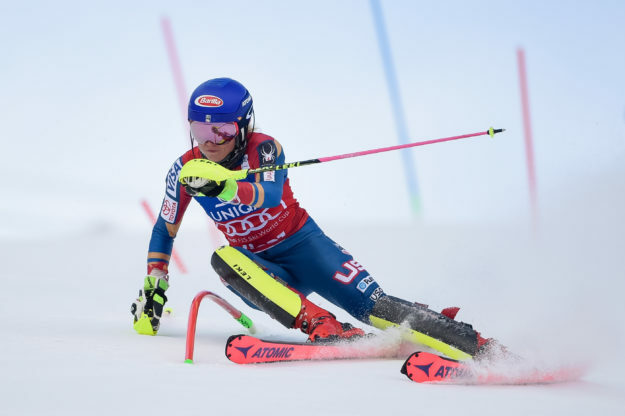 In the second run, she charged the top portion of the course, throttled back a bit in the steep middle section and then in classic Shiffrin style, charged to the finish to win by 0.89 seconds. With her victory, Shiffrin extended her overall World Cup lead to almost 400 points over Germany’s Viktoria Rebensburg. She also leads the overall World Cup slalom, giant slalom and downhill standings. Up next, the women race giant slalom Friday in Lienz.